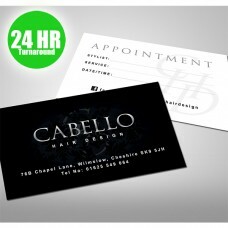 When it comes to creating the perfect business card urgently, it all begins with Final Print UK. We work around the clock to ensure you have the best business card for any potential customers, printed with a 24 hour turnaround. So be the first to kick start your conversations with a high quality business card. Printed with a variety of finshes that are suited to fit your budget. Ensure that your business card portray's the right image and the most important information about you. Final Print UK can provide you with a complete luxury stationery package including compliment slips, business cards and letter heads. Contact us if you have any special requirements. • We offer design serives. (Proof in 48 hours. Contact us if you need it sooner). Please contact us for delivery prices.